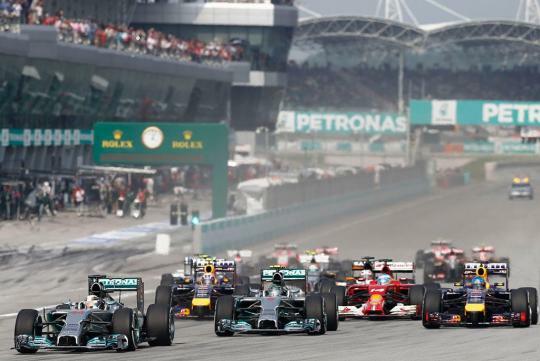 Pulling away from a flawless start, pole sitter Lewis Hamilton had a Vettel-esque lights to flag race after leading the silver arrows team for a one-two finish. 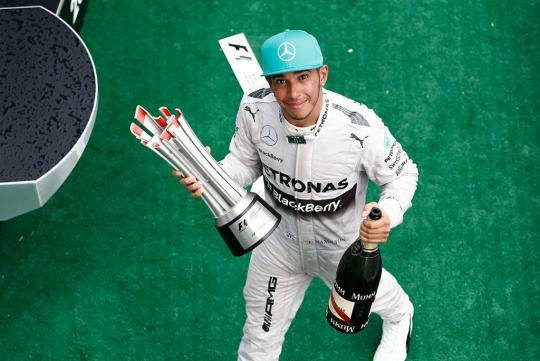 He crossed the dance of the chequered flags ahead of team mate Nico Rosberg, by 17.3 seconds. The result is the first one-two finish for the German team - since the 1955 Italian Grand Prix - where Juan Manuel Fangio finished ahead of Piero Taruffi by just 0.7seconds in Monza almost 60 years ago. The win comes after Hamilton suffered the past nine races without a podium - one of his worst dry spells since he entered the sport at the start of 2007. And the win is a turnaround after Hamilton retired at the Australian Grand Prix two weeks ago due to a misfiring engine. Trailing behind Nico Rosberg was quadruple champion Sebastian Vettel who brought the sole Red Bull home to a third place - although 25 seconds slower than the race winner. Fernando Alonso and Kimi Raikkonen brought the prancing horses to fourth and 12th respectively, as the latter suffered a puncture after McLaren rookie, Kevin Magnussen, ran into the back of Raikkonen's rear-right tyre. This resulted in the Iceman making a slow journey back to the pits. For his actions, Magnussen was slapped with a five-second stop-and-go penalty and eventually finished in ninth. Nico Hulkenberg and Jenson Button secured fifth and sixth respectively for Force India and McLaren. The Williams duo of Felipe Massa and Valtteri Bottas crossed the line with an impressive seventh and eighth, while Toro Rosso's, Daniil Kvyat, grabbed the last point-scoring position. 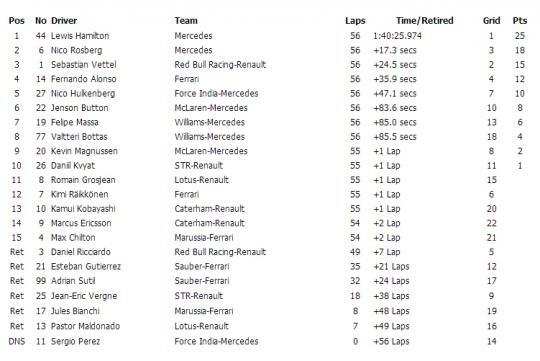 Out of 22 cars only 15 finished as seven cars - including Daniel Ricciardo's Red Bull - retired from the race. Sergio Perez was the first, as he failed to start - citing a gearbox issue. Congrats Lewis!!! Well deserved win! Win at Petronas homeland somemore. Boleh lah!